The file comparison utility “diff” outputs differences between two files. In the past, “diff” compared text files. Modern versions of “diff” compare binary files such as audio and video files. Web designers can use “diff” to quickly compare files. Programmers can use the differences as messages for source control management systems. In this tutorial, “diff” will be used to compare text files. This tutorial uses the command line tool called “diff”. The “Old.txt” file contains text that will be compared using the “diff” command. The “Old.txt” will act as the original content for comparison purposes. 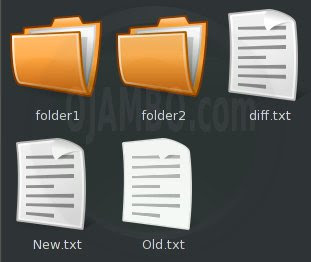 The “New.txt” file contains text that will be compared using the “diff” command. The “New.txt” will act as the changed content for comparison purposes. 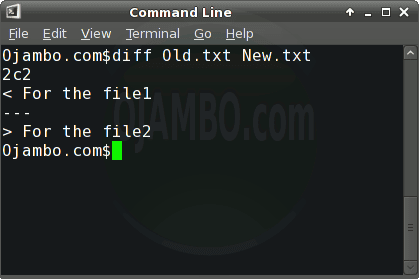 The “diff” command will compare two files and output any changes. The output contains the line numbers of the applicable changed lines. The “2c2” means that line 2 for “Old.txt” is different from line 2 for “New.txt”. Two options are available in order for the two files to be the same. The first is to make line 2 of “Old.txt” the same as line 2 of “New.txt” which is indicated by the less than symbol “<". The second is to make line 2 of “New.txt” the same as line 2 of “Old.txt” which is indicated by the greater than symbol “>”. The lines that differ are printed with either a preceding greater than or less than symbol. Determine path to files for comparing. Run the “diff” command as “diff original.txt changed.txt”. The file comparison tool “diff” is a command line utility used to output changes between files. The output contains the affected line numbers. The output also shows the content of the affected line numbers preceding a greater than or less than symbol. The programmer can determine to revert changes based on the line number output. The affected line number output is based on the order in which the “diff” command was used. Let the original file be the first file used by the “diff” command. Use file comparison for changed files. Use file comparison to approve changes. This entry was posted on Wednesday, October 17th, 2012 at 12:00 am	and is filed under Tips & Tricks. You can follow any responses to this entry through the RSS 2.0 feed. You can leave a response, or trackback from your own site.